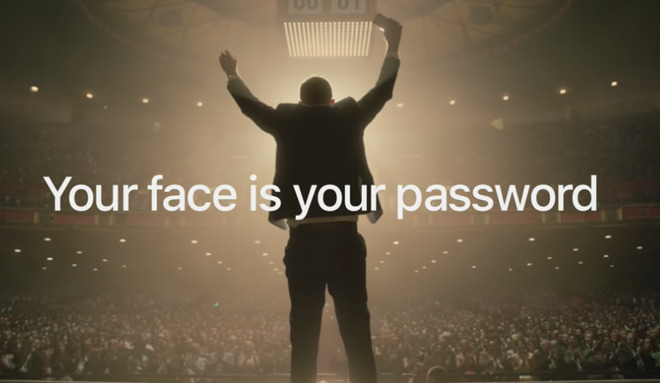 Apple has published a new commercial to its YouTube channel, with a video highlighting the usefulness of Face ID on the iPhone X to help its users stop worrying about forgetting passwords for online services. The "Memory" ad spot opens with a large theater applauding two figures on a stage, in a surreal public memory challenge. For the participant's final challenge, the host asks "This morning you created an online banking password. What is it?" Following gasps from the audience, the contestant starts talking to himself, trying to remember what he had set. As time runs out, the audience starts jeering at the man, intensifying the stressful situation. Suddenly, the contestant pulls out an iPhone X showing an authentication screen with the password box empty. Face ID activates, fills in the box, and allows him entry. The man then has a look of relief at being able to log in, with the scene revealing he is actually sat inside a coffee shop, still holding the iPhone X. "Your face is your password," the video declares while the man waves his iPhone in celebration to the "memory challenge" audience, before revealing the ad was about Face ID on iPhone X. The new commercial is one of a number Apple has produced to promote Face ID and its functionality. March's "Unlock" commercial featured a high school student unlocking various things by looking at them, after using Face ID to unlock her iPhone. Another March ad showed a man using Face ID with Apple Pay to buy items while walking through a market. In April, a series of shorter spots showed how Face ID's biometric authentication can be used to quickly pay for goods and services.